VIJAYWADA: In the first official purchase of land by a private player in Amaravati, a first by a private university as well, Vellore-based VIT University has given a cheque for Rs 50 crore to the Capital Region Development Authority (CRDA). At a review meeting chaired by chief minister Chandrababu Naidu here on Wednesday, vice-president of the varsity Sekar Viswanathan presented the cheque to CRDA commissioner Cherukuri Sridhar. It may be recalled that the state cabinet decided to give 150 acres of land in Inavoluin the capital region. It is said that the land will be given in two phases - 100 acres, firstly and the remaining subject to condition that the first phase should have 18,000 students within five years of commencement of operations. The Rs 50 crore cheque has been given to purchase the 100 acres in the first phase. The VIT delegation also gave an animated presentation to the CM about how the campus would look like. It is said that the varsity will invest Rs 3,400 crore in the next ten years so that the campus can accommodate 32,000 students. The varsity will also be holding the foundation stone-laying ceremony to launch the construction work on November 3 at Inavolu. CM along with Union ministers are expected to participate in the programme. The government has also decided to allot land to other private universities such as SRM and Amity. More than 300 acres of land in the capital region is earmarked. Vijayawada: The state cabinet, which met here on Monday, cleared the decks for another four private universities and an Institute of Financial Management Research. Finance Minister Yanamala Ramakrishnudu at a media briefing said the move is expected to help the state attract investments worth over Rs 3028 crore. Private universities which expected to establish their branches include RS Trust (VelTech), World Peace University (Maharashtra Academy of Engineering and Educational Research) and Great Lakes International University (Great Lakes of Institute of Management). Two of them will come up in Sri City and one each in Chittoor and Visakhapatnam. It may be recalled that the government has already allotted 100 acres of land for four universities in the past such as VIT, Centurion, SRM and Amity Universities in Amaravati. The state government has passed the Private Universities Bill in the Assembly recently to pave the way for establishment of universities under private management.The government proposed to establish World Class Integrated Food Processing complex at Makavaripalem in Visakhapatnam district under private management. The cabinet resolved to allot 115 acres to a private company for establishing the food processing complex. It is also decided to allow a food park at Kothapatnam in Nellore district for refining 3,000 tonnes of sugar. A tourism corporation will be developed at Bhavani islands in Vijayawada. A cabinet sub-committee was constituted to examine the legal complications likely to arise if the Secretariat in Hyderabad was transferred to Telangana. The Cabinet felt that the Secretariat shifting process was still to be completed and that it might not happen immediately.The Cabinet also formed another sub-committee to explore the legal options over the Brijesh Kumar Tribunal’s latest award over distribution of the Krishna water. The government is of the view that the award delivered a blow to the state’s irrigation interests. A revamp of syllabi for undergraduate courses, setting up of incubation centres on university campuses and exploring collaboration with industries are some of the initiatives discussed at a meeting of vice-chancellors held here on Monday. Vice-Chairman of AP State Council for Higher Education C. Narasimha Rao said that to face the challenges of making students more employable and to meet the requirement of high skilled jobs, the universities have been asked to make changes in the curriculum to include soft skills. “We have also discussed some ideas, including setting up of incubation centres, promote industry-institute interaction, introduction of biometric attendance system,”said Mr. Narasimha Rao. The vice-chancellors have been asked to promote innovation on campuses and encourage creative projects. Funding would be sanctioned for innovative projects, said Mr. Rao. Recruitment of assistant professors in various universities through a screening test has also been discussed, but the State government is yet to take a decision on the date of test. Principal Secretary, Higher Education, Sumita Dwara, secretary, collegiate education, B. Udaya Lakshmi, vice chancellors of ANU, A. Rajendra Prasad and other V-Cs were present. AMRAVATI: Even as the state government is a widely publicising that international universities like Harvard, Stanford, Boston, California and others have evinced interest for establishing campuses in Amaravati, no concrete step is taken in that direction. According to CRDA officials, discussions over setting up of universities are still in a preliminary stage. 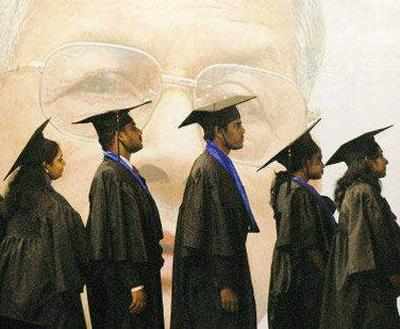 Sources in CRDA say that it is still not clear if the universities are going to partner with their Indian counterparts . There is no clarity on whether they would set up just a research centre (Harvard University has a research centre in Mumbai) or a campus. "It is true that there are proposals to have global universities like Harvard, Stanford and other Ivy League institutions in Amaravati. The government is pushing for them, but it is early to say that they will set up a campus in the capital region. There is a long way to go before anything takes a concrete shape," a senior official from CRDA said. It is learnt that the prestigious universities are most likely to partner with local universities in offering courses. "The universities in our state are forging links through memorandums of understanding for research-based courses with foreign institutes like Cambridge, National University of Singapore and others. But whether or not these universities will set up campuses here is still not clear," the official said. CRDA commissioner Cherukuri Sridhar told TOI that discussions are going on. "The global institutes are planning to foray into India and have evinced interest to explore Amaravati. A few rounds of discussion have already taken place. As the talks are in the early stage, we don't know if they will set up campuses or research/facilitation centres. Our government is in touch with the universities," he said.